Trumpeter and composer Dave Douglas has long sought out new and novel settings for his pen and his horn. 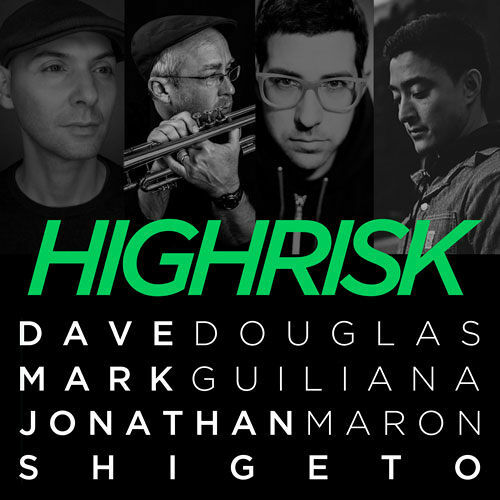 His latest project, High Risk, features him in highly electronic territory, in the company of beat-minded drummer Mark Giuliana, Groove Collective veteran Jonathan Maron on bass & Moog, and electro whiz Shigeto. Perhaps the difference betweenelectric and electronic is mere semantics, but in this show Douglas exhibited the stark contrast from his previous electric bands like Keystone. The band is really a vehicle for Shigeto and Douglas – a true meeting of their minds. At one point towards the end of the set, they performed a duo piece which gradually became a showcase for Shigeto’s sonic wizardry as Douglas ceded the stage. Shigeto’s role was fluid – sometimes he was playing synths, at other times he was triggering samples like a DJ, at other times he was manipulating sounds like no one else. His palette was, for the most part, metallic – sounds somewhere between xylophones and keychains filtered beyond recognition and sent through loads of delay and reverb. On the opening tune, Douglas was in his plaintive, hymnal mode (one of my preferred sounds of his), with him and Maron shifting the harmony around Shigeto’s harmonically ambiguous pads. Giuliana is the perfect drummer for this band – his own deep relationship to electronic music allows him to blend seamlessly with Shigeto’s electronics. He also received a lot of crowd enthusiasm for a couple of warp-speed drum solos that were profoundly musical in addition to being showstoppers. I haven’t seen Douglas this visibly energized about a band – he was jumping onstage while he left space for the trio. His horn was in top form – the half-valve glisses he is known for were longer and stronger than usual, and he often played off-mic and still filled the room with sound. Kudos to Geoff Countryman, the band’s sound engineer, who has worked alongside Douglas for many years. Not only did he mix the electronics beautifully into the live instrumentation, he also got some of the best sound – point final – that I’ve heard in L’Astral for years. Douglas ended the set on a powerful and poetic note: a new ode to Mike Brown and the events in Ferguson, MO. Beginning with Giuliana’s simple, thudding 8th note kick, Douglas unfurled a truly stunning dirge, cloaked in Shigeto’s electronics and framed in red light. The encore-loving crowd demanded more, and received a dubby, energetic nightcap, but I was so tempted to leave after the tribute to Mike Brown. After Douglas’ last mournful Eb rang out of that tune, what more could there have been to say – or to play? 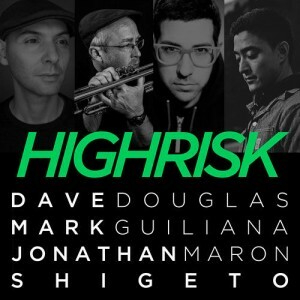 This entry was posted in Reviews and tagged dave douglas, high risk, jonathan maron, mark guiliana, montreal jazz fest, shigeto on July 2, 2015 by CKUT Music Coordinator.